Foreign Minister Hor Namhong on Thursday summoned the country’s diplomatic corps to deny that he had played any role in the issuance of an arrest warrant for opposition leader Sam Rainsy last week. The minister also attempted to explain the government’s actions in seeking Mr. Rainsy’s arrest on a four-year-old defamation conviction in a lawsuit brought by Mr. Namhong himself, insisting that the brouhaha was not political but strictly personal. Mr. Namhong initially sued Mr. Rainsy after the opposition leader gave a speech accusing him of collaborating with the Khmer Rouge while interned at the Boeng Trabek prison camp. Mr. Rainsy was convicted in 2011 and sentenced to two years in prison, but the verdict was not enforced until last week, when the Phnom Penh Municipal Court issued a warrant for the CNRP president’s arrest following a request from Mr. Namhong’s lawyer, Kar Savuth. 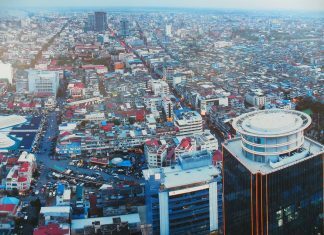 However, Mr. Namhong claimed on Thursday that Mr. Savuth had not been acting on his behalf, and that the request had come as a complete surprise to him, as well as to Prime Minister Hun Sen, another one of Mr. Savuth’s clients. “I have transferred the right to handle this case to my lawyer and I did not order him at all. The request to have the warrant issued was made by my lawyer—it was not an order by me,” the foreign minister said. Asked for comment on Thursday, Mr. Savuth hung up on a reporter. 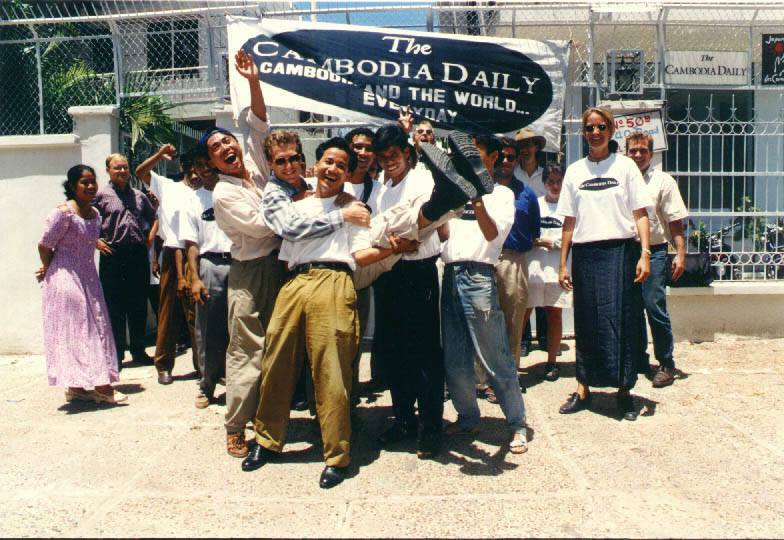 Mr. Rainsy, who was in South Korea at the time the arrest warrant was issued, has yet to return to Cambodia. On Monday, the opposition leader was removed from the National Assembly by CPP lawmakers, stripping him of his parliamentary immunity. Numerous embassy officials declined to comment on Thursday on the closed-door session with Mr. Namhong. U.S. Embassy spokesman Jay Raman would only confirm the attendance of acting charge d’affaires Julie Chung, adding that the embassy’s position on the recent political turmoil in the country remained unchanged. A statement released by the embassy following Mr. Rainsy’s removal from the National Assembly on Monday called for the opposition leader’s immediate reinstatement and the revocation of the arrest warrant. French Embassy spokesman Nicolas Baudouin also confirmed that his country’s ambassador had been in attendance, but declined to answer any other questions about the meeting. 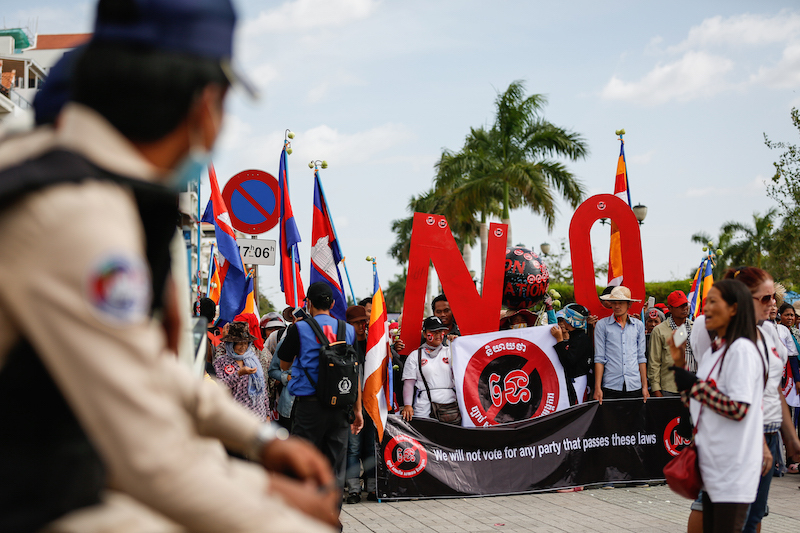 “We are concerned by the arrest warrant issued against Sam Rainsy and his subsequent removal as leader of Cambodia’s parliamentary opposition in the National Assembly,” he said in an email. 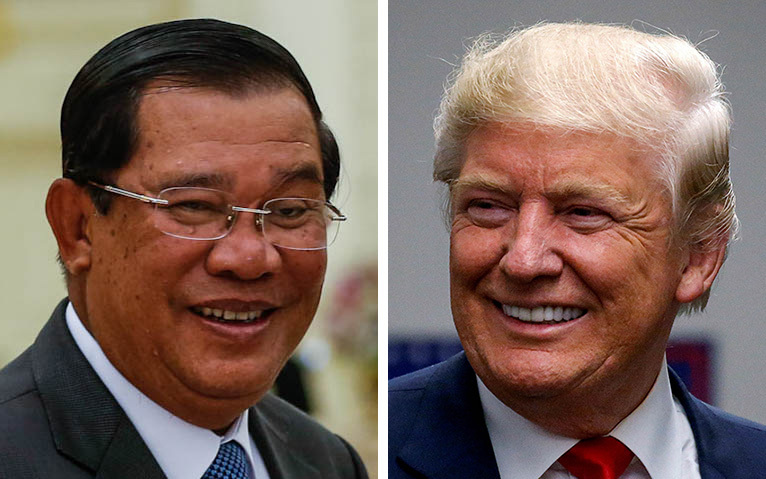 “The Secretary-General urges the Cambodian People’s Party and the Cambodia National Rescue Party to resume their cooperation and dialogue and encourages all political players to refrain from violence, intimidation and harassment,” the statement said. Phil Robertson, Human Rights Watch’s deputy Asia director, said it was unlikely any of the diplomats summoned by Mr. Namhong would have been swayed by the foreign minister’s explanations.